Since her submission to Midnight Ink in the fall of 2009, Minnesota resident Jessie Chandler has been preparing for this moment–the publication release of her mystery debut, Bingo Barge Murder. She and I met several years ago in a class taught by teacher extraordinaire, Ellen Hart. I knew Jessie was having fun writing and I knew the writing was good–her caper is about Shay O’Hanlon, owner of a quirky-cool coffee shop whose longtime friend becomes a murder suspect and she must find the real murderer without help from the cops. 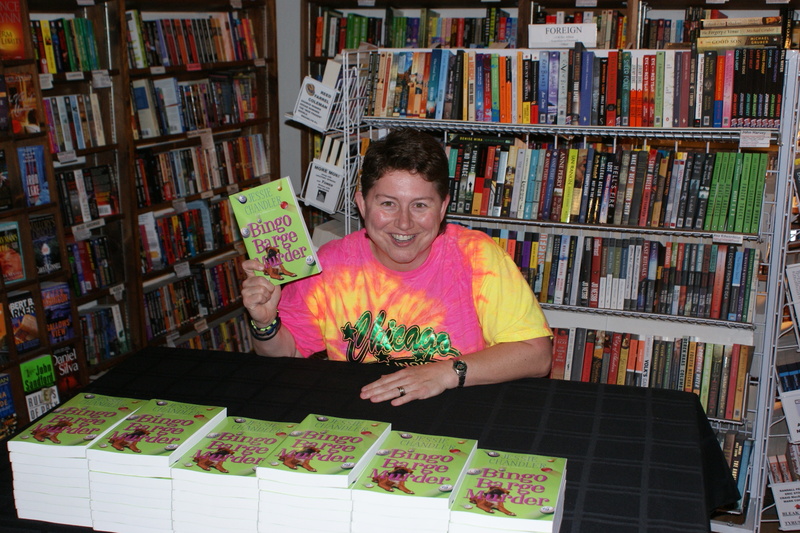 In February 2010, Jessie signed a three-book contract with Midnight Ink, setting in motion a healthy but rigorous writing schedule for the next two books. So what kind of support did Midnight Ink provide for her book launch? It was worked out between Midnight Ink and Once Upon a Crime bookstore to have her launch party there. Recent winner of the Raven Award at the Edgars this year, the Minneapolis bookstore is where many local authors launch their mysteries. Midnight Ink also sent release info to about 200 outlets and sent galleys to Publisher’s Weekly, Kirkus, and Library Journal. They did some advertising in the Star and Trib, the Pioneer Press, and on their web site. They also set up signings at True Colors bookstore and Valley Booksellers in Stillwater. And what kind of marketing and spreading-the-word is Jessie doing for herself? She says she’s going to mail post cards to as many mystery and lgbt bookstores as she can find and try to get events set up at some B&Ns for the fall. This entry was posted in Events and tagged Bingo Barge Murder, debut mysteries, Jeannelutz wordpress blog, Jessie Chandler, Midnight Ink, Once Upon a Crime. Bookmark the permalink.